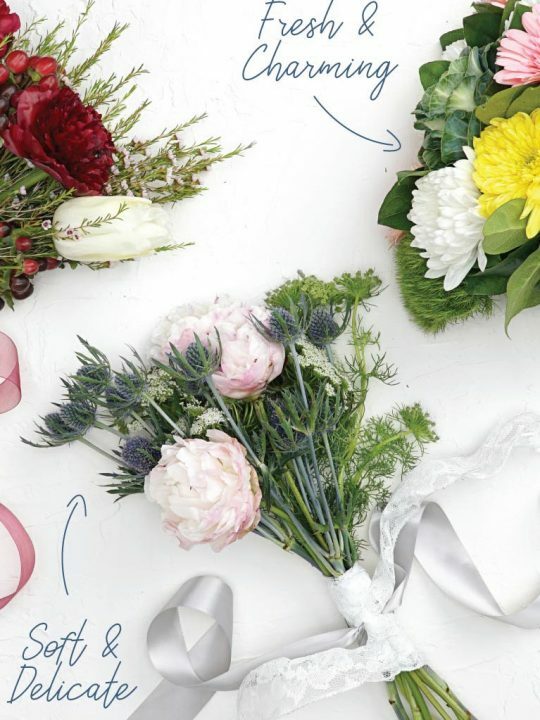 It’s been a brief hiatus for our DIY Wednesday features, but Ribbons & Bluebirds is BACK today with a KILLER DIY tutorial today! 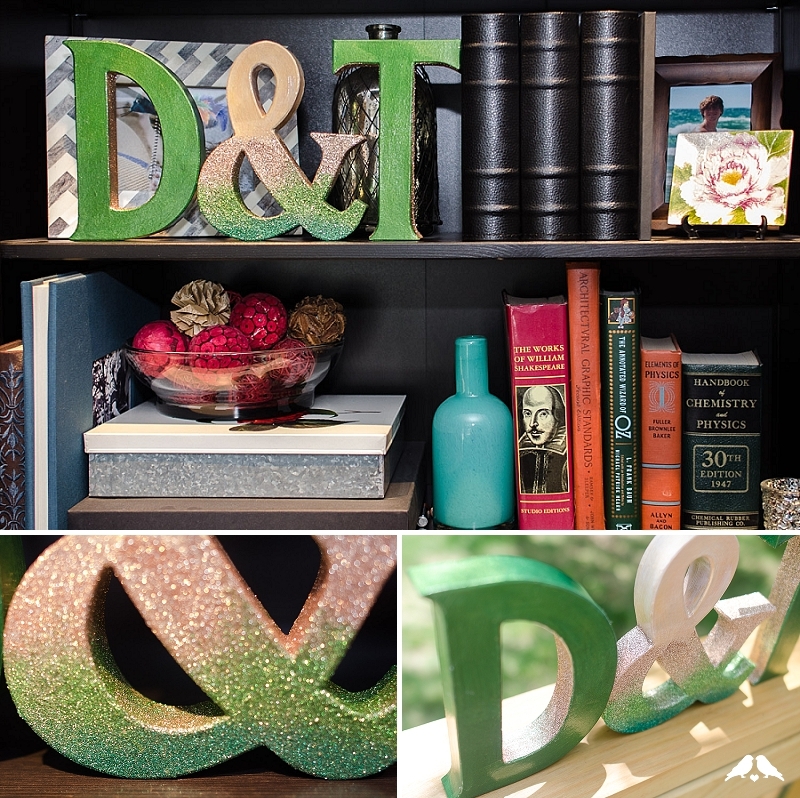 It includes monogrammed letters (a great wedding DIY decor item), glitter, and ombre – I mean, what’s not to love!? Take it away Jen! 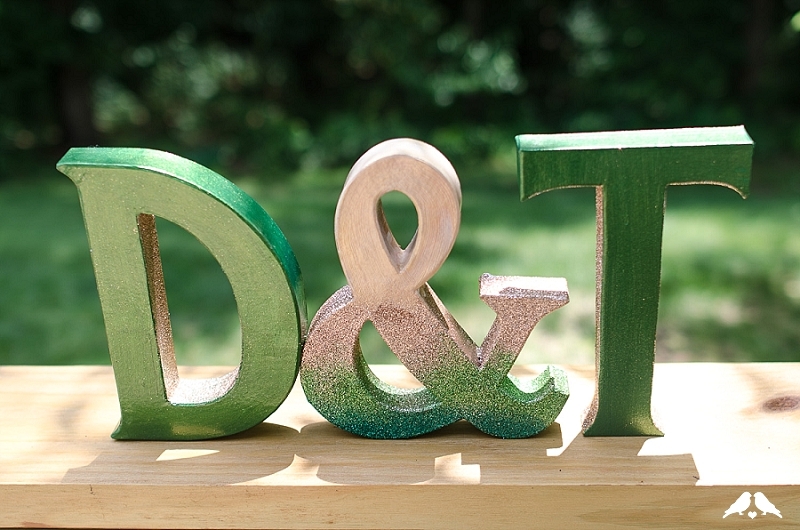 • Paper or wooden letters of your choice – they do need to be thick enough to stand up on their own. Mine are the kraft letters from Paper Source. • Glitter of at least 3 colours. 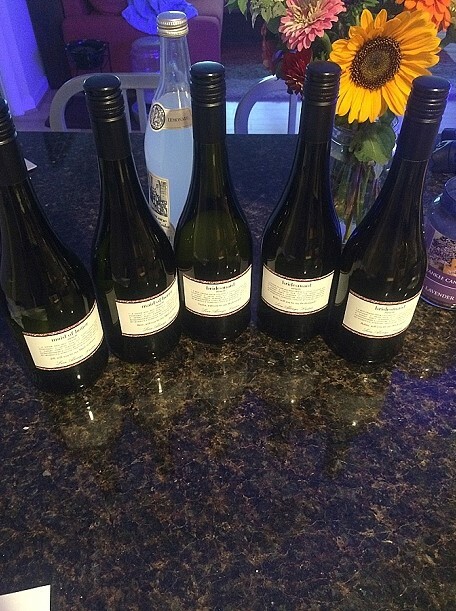 I can’t lie to you – I love shiny things. I love sparkly things, I love glittery things, I love things that catch the light… apparently I also have the brain of a bird. 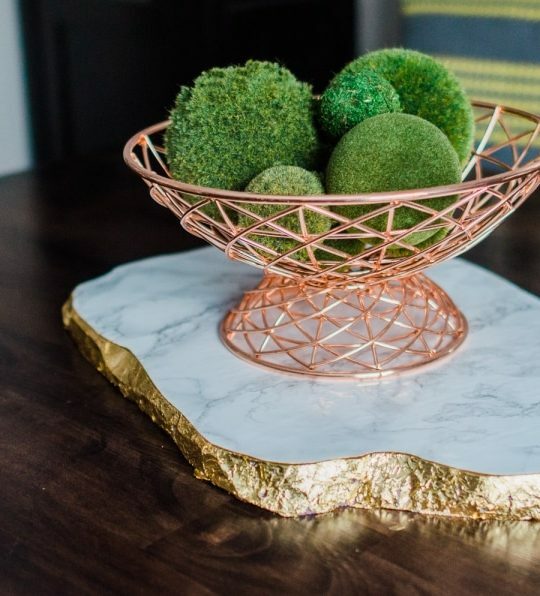 So it should be no surprise that I love using glitter in my craft projects, but I consider it a personal challenge to take glitter beyond the ordinary. Not this far beyond, but beyond. 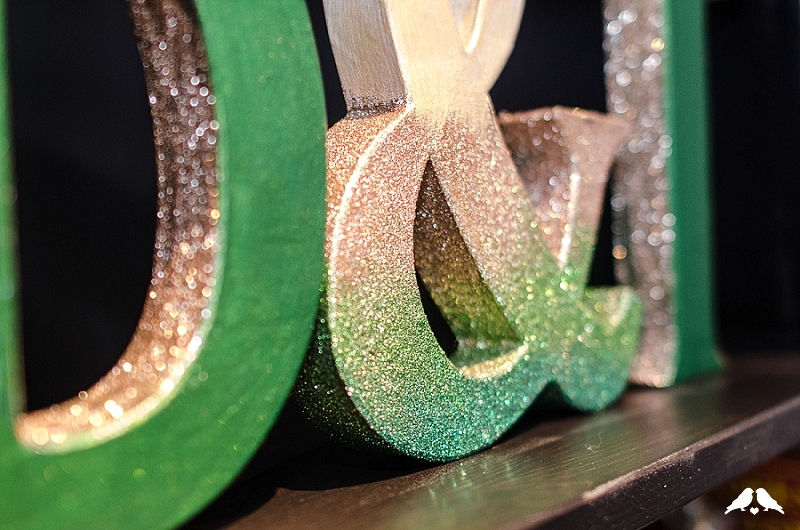 One of the projects I made last year as part of my staged tablescape series was an ombre glitter ampersand, and I absolutely adore it – it is on display in my office now all the time! 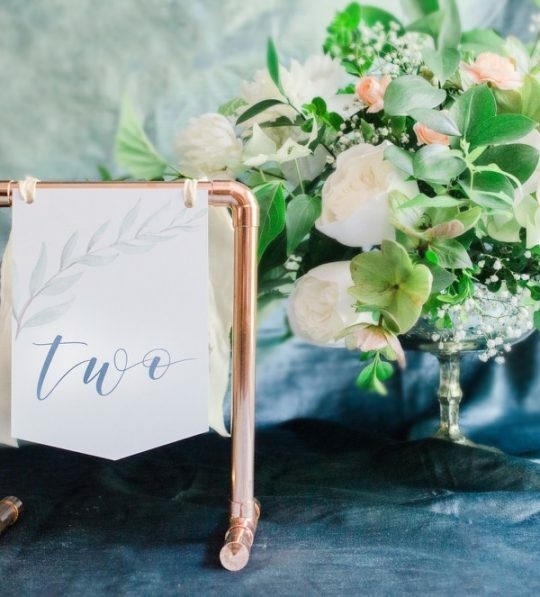 So here’s my tutorial for a glitter ombre monogram project – perfect for a table display at weddings, showers, parties, or any time you need a punch of sparkle! Step 2. If you want your glitter to fade in (if you’re not covering the whole letter in glitter) then spray glue should be your glue of choice. 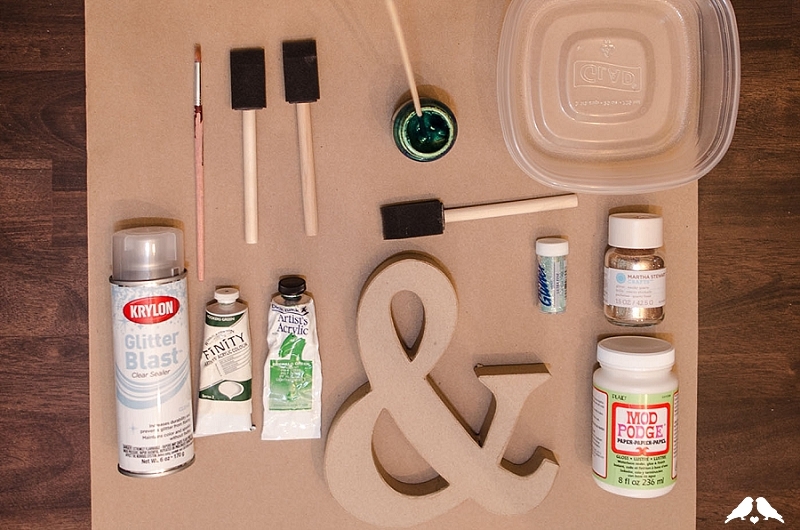 If you’re planning to coat the whole letter in glue, you can use whatever glue works best for you. 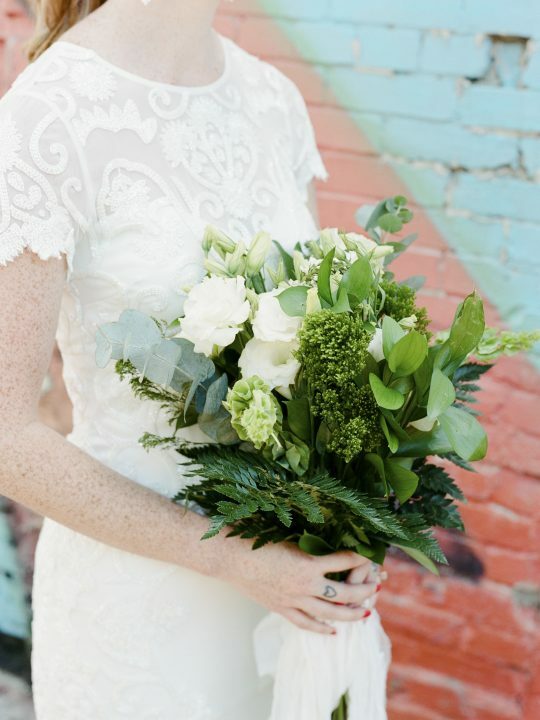 When using spray glue, be sure to use a well-ventilated area and cover any surfaces that you don’t want to be vaguely sticky. I always try and work outside with spray glue. Start by spraying the back of your letter, in even light even strokes. 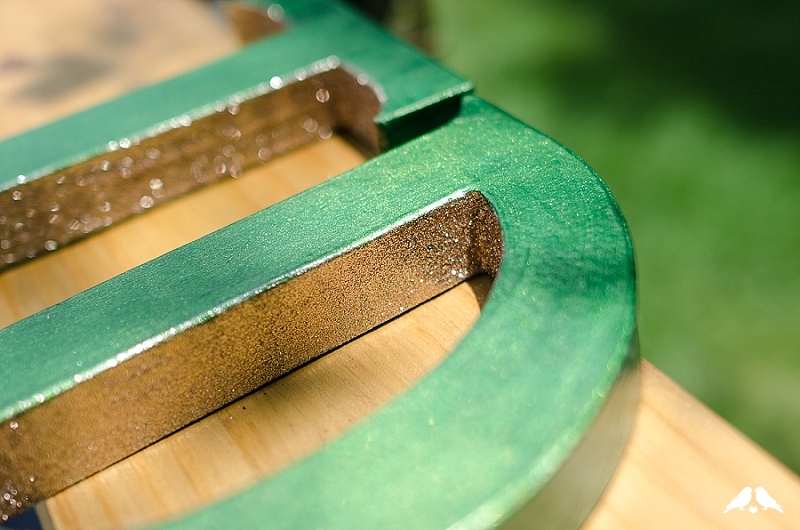 This should allow you to lay the front of the letter on a table and apply the glitter – if you’re glittering the whole letter, you will need to work in two stages to allow you to still pick up the letter. Step 3. 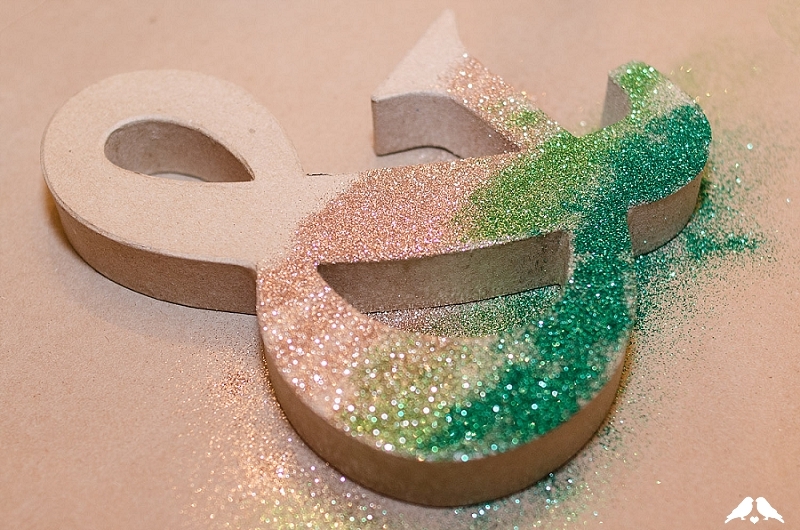 Start with your “top” glitter colour and apply a stripe across your letter. Sprinkle the glitter more lightly where you will fade in your new colour. Repeat with all your colours until you get to the edge of the letter – you should have stripes of colour across your letter. 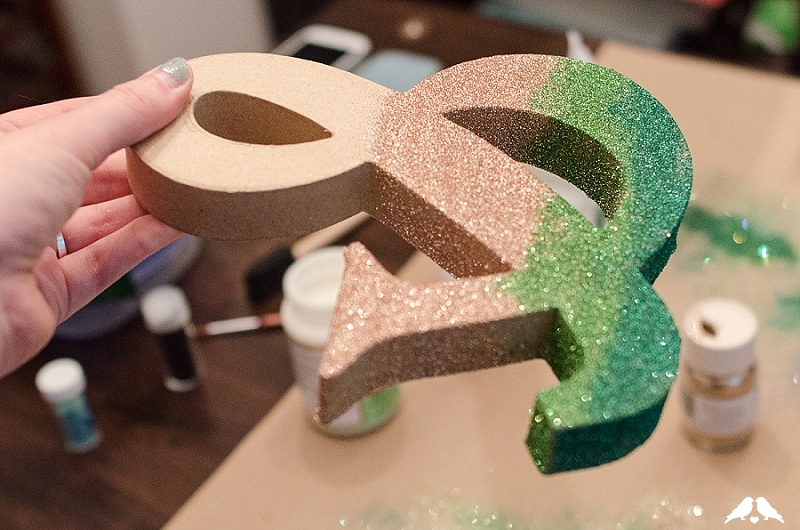 Click inside for the rest of this AWESOME DIY ombre glitter monogram tutorial! Step 4. Pick up the letter so the loose glitter will fall in the direction of your fade – in my case, it’s top to bottom – and tap to remove the loose glitter. You can use your finger to blend glitter at the intersections of colour if the transition is too stark for your taste. Step 5. Now repeat by applying the spray glue to the front and inside edges of the letter. This time, I hold the letter in the air to make sure the back doesn’t smear as it is drying, and I let the glitter for each stripe continue to colour the sides as well. Step 6. Let the glue dry before applying the glitter sealer. Again this wants a well-ventilated area, and I highly recommend outside. 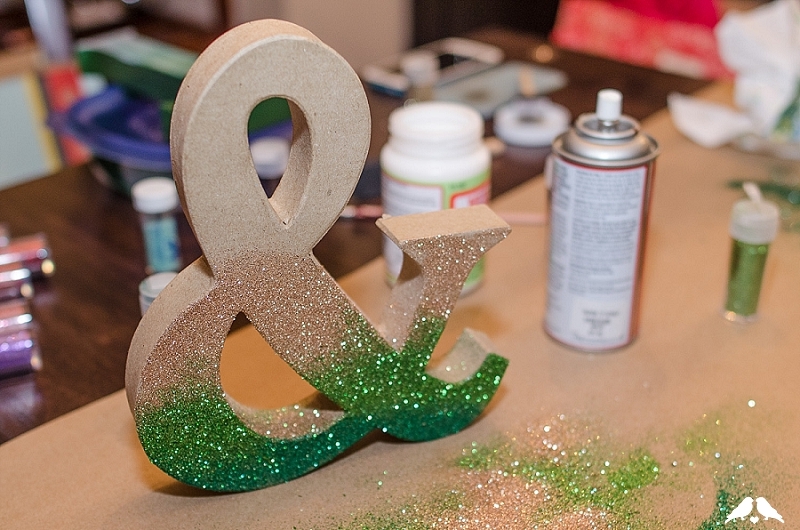 The spray burst from the sealer can will knock off additional glitter. 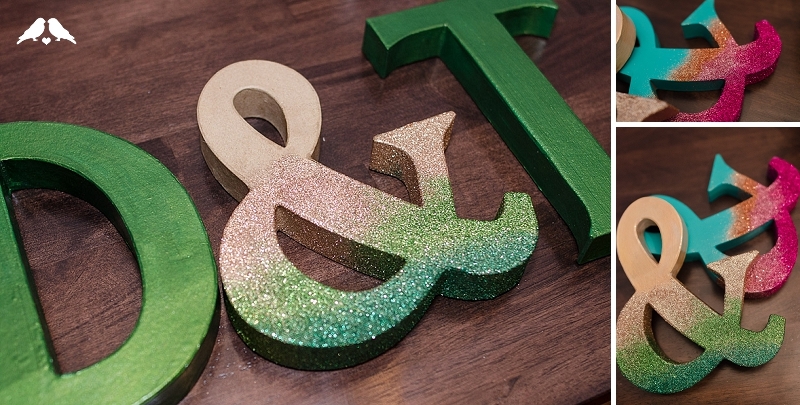 Use the sealer in light coats, as I learned from experience that if you over-soak the letter it will actually dissolve the spray glue and the glitter will run in drips!) You can apply multiple coats if desired. Step 7. For an extra punch to my monogram, I chose to line the inside of my intial letters with a pop of gold glitter. I used Modge Podge in a gloss finish as a glue, painted it along the insides of the letters, and the applied gold glue. I sealed them in the same way I sealed the ampersand ombre. Step 8. 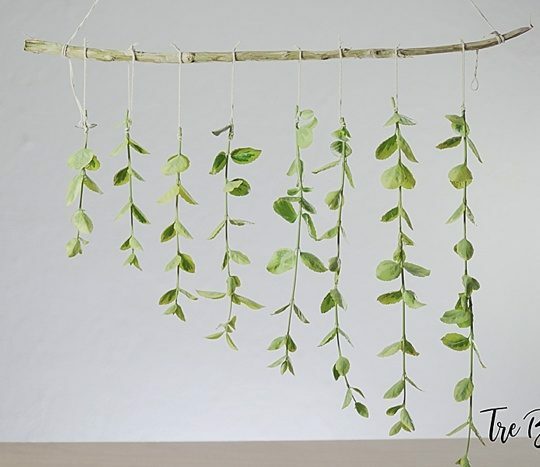 Let everything dry, and you’re done! For glitter cleanup, I find that either a tack cloth used for dusting before painting or a Swiffer dry sweeping cloth work well to get up all those pesky stray sparkles. That’s it! 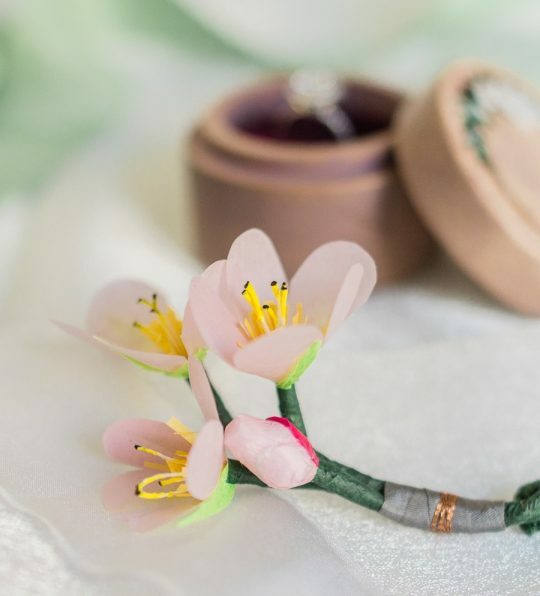 This method is a simple way to dress up an average glitter creation, and you can really apply it to anything glue will stick to. 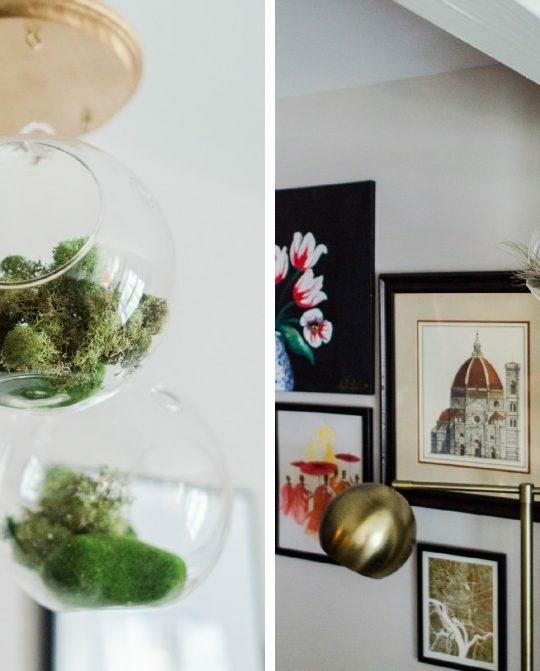 Cannot thank Ribbons & Bluebirds enough for this AWESOME DIY tutorial!!! 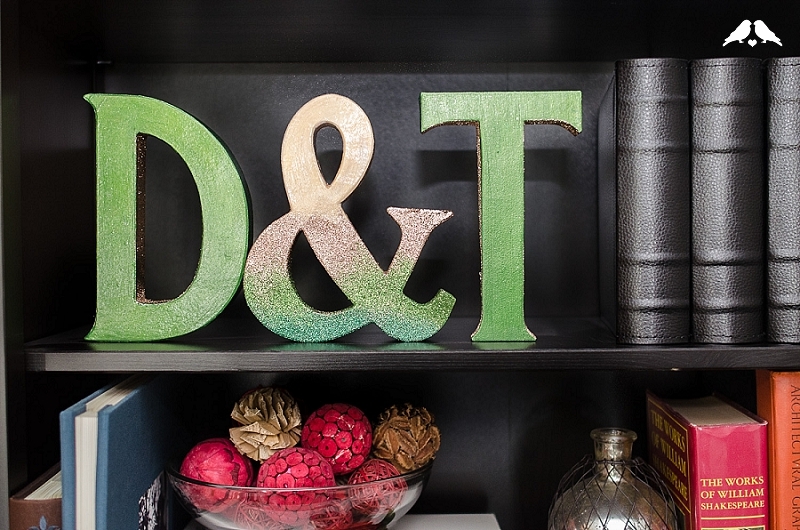 Show us your DIY glitter ombre monograms! These are amazing! Thanks for the tutorial.